I had a dream on Sunday morning. It was not a nightmare. It was a stressmare. I was supposed to be at work but came home for something and wound up going through a portal to another city where work could not contact me. My communications equipment then died and I spent the entire time worried that they'd try to reach me and not be able to and I'd get in trouble. So stressful! Ugh. I woke up quite frazzled and crawled from the bed to start tea, check my garden (the Zucchini needed pollination) and logged in. Wex appeared and told me that we had solved the freighter problem. The freighter problem was that we use a freighter to move things from the station to the POS for the capitals. Components are huge. Mineral volumes are huge. We built the freighter in Sujarento because it was cheaper then buying one on the market. It is also less of a risk then a jump freighter for those times when you forget to enter the POS password and find yourself sitting in the darkness waiting for someone to kill you. We had discussed moving it by convoy or just sending it the one jump through Tama to high sec and building another one. The freighter problem was one of my things that needed to be done and solved that I didn't have the urge to do. Freighters moving through low sec horrify me. I've killed my share. So, I log in and peer at my screen and Wex tells me that Mortvvs has solved our problem. Wex was discussing the freighter problem and Mort goes, "Bridge it." Hot damn. That makes complete and total sense. I didn't think of it. I however feel that is okay. Wex didn't think of it. I'm gonna forgive him as well. Nether of us owns a Titan after all. But Mort goes and sets everything up and I'm sitting there with Wex telling me that Mort is ready to bridge the freighter. I'm not ready! I wailed somewhere in the back of my mind. After all, I had just spent hours stressed about not being able to get to my job because I had to wait for the bus to go back to the portal so I could come back to our world. That however was a dream and this was not. Somehow, I managed to log in other characters and set up courier contracts to myself, for myself, to move a huge amount of stuff that needed to be moved for production reasons. Did I mention that I'm also terrified of towers? The titan of course is in a regular corp tower that I could warp to. However, one bad experience and I'm distrustful of everything. But Mort is ready and Wex is getting a cyno in position and I'm undocking and warping to the tower knowing I will bounce and die. Charon's are next to Erebus. I do not think that I ever expected to see my freighter sitting beside a Titan. Wex was jumping a carrier at the same time. 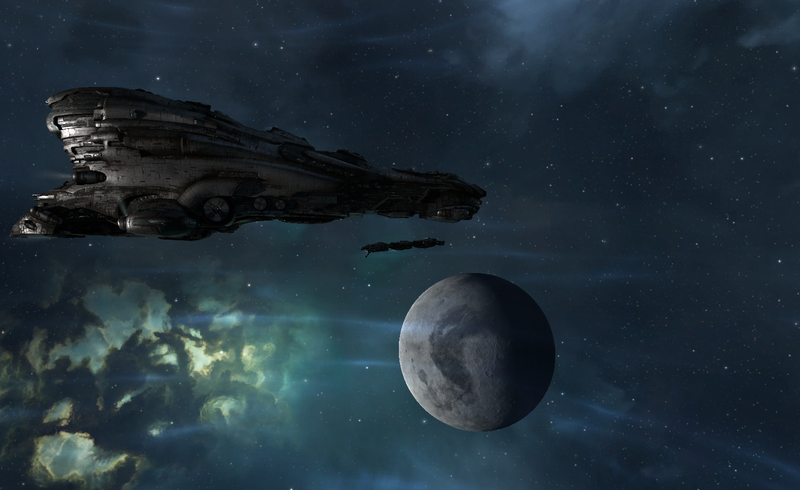 He lights the cyno and jumps his carrier. He wants to double check the cyno spot he has selected. Mort opens the bridge and goes, "bridge is up" and like a duckling taught to follow in a line I jump. "There goes checking the cyno spot," says Wex. We don't bump. I dock. That was ridiculously easy. I guess I need to get the rest of the stuff moved nw that productivity has happened. My God what a disturbing dream!!! Has this ghostly portal to another world lurked long in your home? In other news . . . Nice to hear their ain't no problem a Titan can't solve. Oh, and in other, other news . . . In case you're not aware, the captcha of the last few weeks makes us match food pictures (this post demanded I match the sandwich). Not that I mind, but I am left to wonder if you, perhaps, had something to do with this. You wouldn't highlight food on you captchas would you?